Film is based upon a true incident. The caper was covered in a book called “Nazi Gold: The Sensational Story of the World’s Greatest Robbery – and the Greatest Criminal Cover-Up” by Ian Sayer and Douglas Botting. The heist was perpetrated by a combination of renegade Nazi and American officers. It was also listed as the “biggest” robbery ever in the Guinness Book of Records, in the 1960’s. In 1945, as Allied bombers continued their final pounding of Berlin, the panicking Nazis began moving the assets of the Reichsbank south for safekeeping. Vast trainloads of gold and currency were evacuated from the doomed capital of Hitler’s ‘Thousand-year Reich’. Nazi Gold is the real-life story of the theft of that fabulous treasure – worth some 2,500,000,000 at the time of the original investigation. It is also the story of a mystery and attempted whitewash in an American scandal that pre-dated Watergate by nearly 30 years. Investigators were impeded at every step as they struggled to uncover the truth and were left fearing for their lives. Donald Sutherland became seriously ill during filming on location in Yugoslavia. His wife received a telegram telling her to come immediately but warning her that he would probably be dead before she arrived. The noise made by electric motors of the Tigers’ turrets was later used for the movements of the power lifters in Aliens (1986). 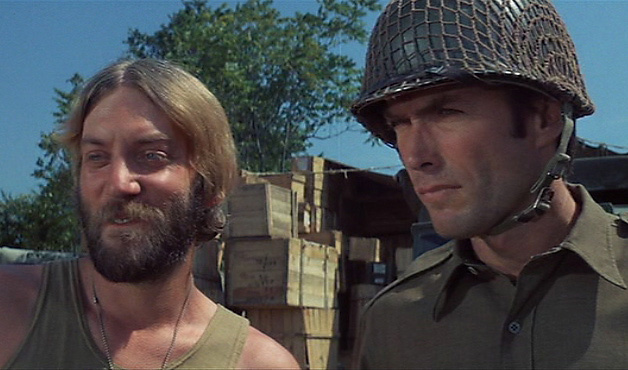 It was during shooting in Yugoslavia 1969, that Donald Sutherland received word, via co-star Clint Eastwood, that his then-wife Shirley Douglas was arrested for trying to buy hand-grenades for the Black Panthers with a personal cheque from an undercover FBI agent. Sutherland recounts this story often, mentioning that when Eastwood got to the part about the personal cheque, he laughed so hard, he fell to his knees, and Sutherland had to help him up. 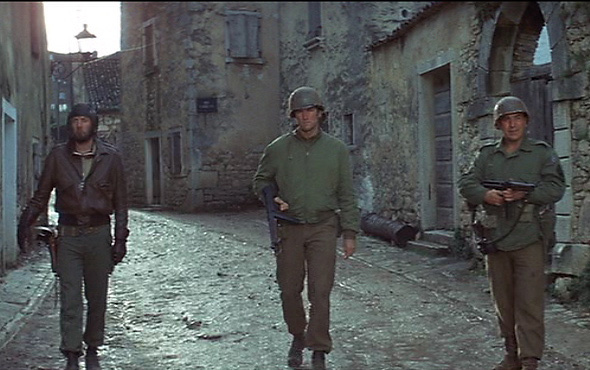 Eastwood then put his arm around Sutherland and walked him down the hill that overlooked the Yugoslav countryside, assuring his friend with complete support of his predicament. Sutherland and Douglas, who are the parents of Kiefer and twin sister Rachel Sutherland, later divorced in 1970. 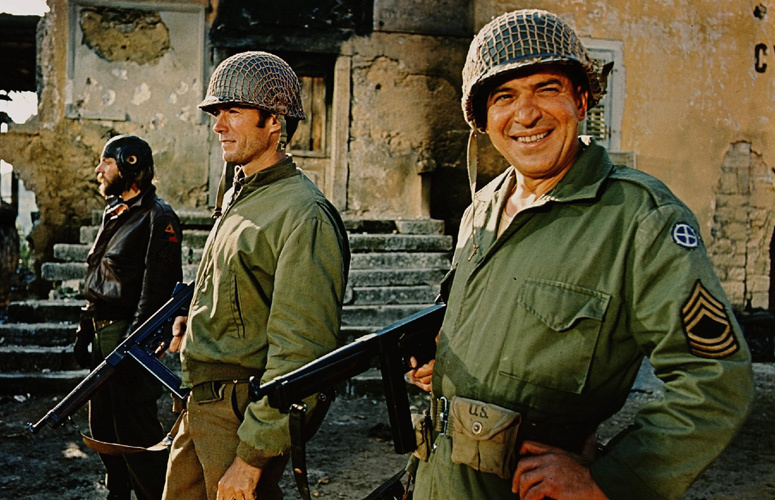 The movie was mainly filmed in Yugoslavia because the Yugoslavian army still had a large quantity of Sherman tanks in 1970. The German Tiger tank commander (played by Karl-Otto Alberty) appears to be a parody – both in appearance and manner of speaking – of Marlon Brando’s portrayal of German Lt. Christian Diestl in The Young Lions (1958). In the nineties, a group of Swedish war game enthusiasts started to build a 1/72 scale model of the town, where the robbery takes place. As they pursued accuracy they even traveled to Vizinada and in fact hired a pilot and plane to get aerial photos of the town. Croatian authorities thought they were foreign spies and arrested them. Reportedly, they were released after a couple of hours. A record was made of Clint Eastwood singing “Burning Bridges”, the theme song from the film. It was released as a 45-rpm disc on Certron Records, catalog #C-10010, produced by Dickey Lee and Allen Reynolds (with the B-side of “When I Loved Her” also sung by Eastwood, and written by Kris Kristofferson). The blue “crosshair” shoulder patch indicates Kelly and his men are from the 35th Infantry Division. It’s a National Guard Division, comprised of Guardsmen from Missouri, Nebraska, and Kansas. Artillery sergeant Mulligan has a humorous name. In golf, a “mulligan” is a “do-over”; a chance to repeat a bad shot. In the film, Sgt. Mulligan is repeatedly berated for his inaccuracy. John Landis was a production assistant on this film. He also appears as an extra (he was one of the three nuns). 14,000 gold bars, valued at $16M, equals about $1,143 per bar. At the long-standing price of $35/troy ounce, the bars would have had to weigh only 32.6 oz (almost 36 oz avoirdupois) each–probably a gross understatement, even though the bars are clearly much smaller than the standard “Fort Knox” size. But even assuming the weight is correct, 14,000 bars would weigh almost 16 tons (not counting boxes, men and equipment)–well beyond the capacity of the truck they were using. Then again (still with me, folks? ), 14,000 bars, at only 12 to a box, would require over 1,100 boxes-seemingly a lot more than is in the pile. So maybe the German colonel was wrong. The American fighter-plane that attacks Kellys group, is actually an Yugoslav “Ikarus Type 522” trainer, that flew for the first time in 1955. Kelly, Big Joe and the other recon soldiers wear the shoulder patch of the 35th Infantry Division, which was fighting in the area of Nancy, France, in late summer 1944. Clint Eastwood signed to do the film mainly because his friend and favorite director, Don Siegel, was set to direct it. However, Siegel ran into post-production problems while finishing up Two Mules for Sister Sara (1970) and had to withdraw from the project. Brian G. Hutton was then signed to direct. Eastwood, who had already signed a contract to do the film, couldn’t pull out. Oddball’s division is the “Super Sixth”, the 6th Armored Division. Mike Curb, who wrote the lyrics to the movie’s theme song “Burning Bridges,” served as lieutenant governor of California between 1978 and 1982. A gold bar of 400 Troy ounces would measure roughly 2 inches x 3 inches x 9 inches and would weigh about 28 pounds. 14,000 bars at 28 pounds is 196 tons requiring a minimum of 78 two-and-a-half ton trucks to transport. The bar seen being handed around like it was a loaf of bread looks a bit larger, roughly 3 inches x 4 inches x 12 inches. A gold bar of this size weighs 75 pounds and 14,000 of these bars would weigh 523 tons requiring 209 trucks. Oddball carries a Luger P-08 “Parabellum” semiautomatic gun, which were in service only in Switzerland and Germany. Oddball and his crew pack up to go over the lines to meet up with Kelly and others while local village girls are running around half naked. The platoon encounters a group of German soldiers and naked girls swimming in a pool. While they wait for Oddball in the barn at night Kelly and Big Joe have a conversation about their disillusionment with the war and why Kelly was made as a scapegoat for the attack that resulted in his demotion. 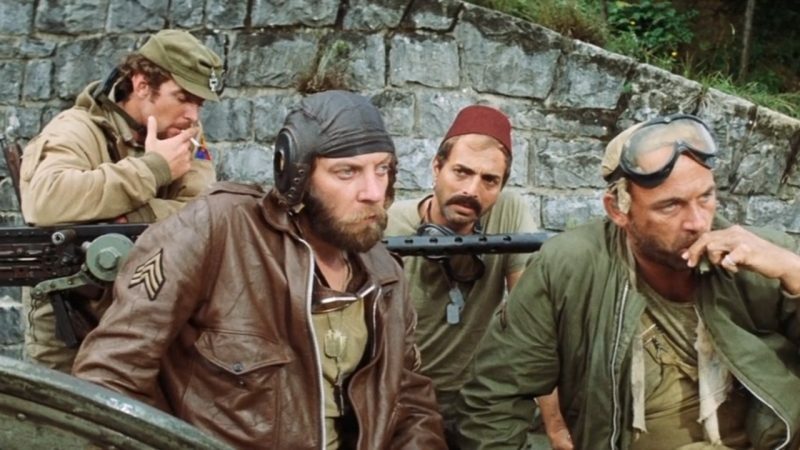 Another scene was deleted from this part where platoon decides they don’t want to continue with the mission and Gutkowski threatens Kelly at gunpoint, but Big Joe and Crapgame side with Kelly and everything turns out O.K. General Colt is in bed with some women when he gets a call that Kelly and others have broken through the enemy lines. During the attack on the town, production designer Jon Barry had a cameo as a British airman hiding from the Germans. One promotional still shows Kelly finding a wounded German soldier amongst the ruined houses during the final town attack. Kelly, Oddball and Big Joe discuss tactics while standing on an abandoned Tiger tank before the scene where they talk with German tank commander. When Kelly and platoon drive off at the end, a bunch of soldiers shout at them that they are headed in the wrong direction. Gutowski carries and uses a Russian sniper rifle, a Mosin Nagant M91/30. Clint Eastwood and Donald Sutherland would share the screen one more time in Space Cowboys (2000).